It has 14 digital input/output pins (of which 6 can be used as PWM outputs), 6 analog inputs, a 16 MHz crystal oscillator, a USB connection, a power jack, an ICSP header, and a reset button. It contains everything needed to support the microcontroller; simply connect it to a computer with a USB cable or power it with a AC-to-DC adapter or battery to get started. The Uno differs from all preceding boards in that it does not use the FTDI USB-to-serial driver chip. Instead, it features the Atmega8U2 programmed as a USB-to-serial converter and has a resistor pulling the 8U2 HWB line to ground, making it easier to put into DFU mode. Robomart Sensor Shield V5 (new version) has the COM and I2C (IIC) ports separated,so that both ports can be utilized at the same time to increase the possibilities of use.It allows you to connect to various modules like sensors, servos, relays, buttons, potentiometers and so on. 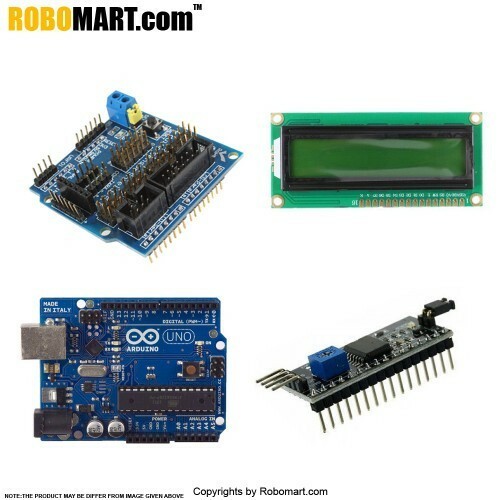 Robomart IIC 1602 is another great blue backlight LCD display. As the pin resources of Arduino controller is limited, your project may be not able to use normal LCD shield after connected with a certain quantity of sensors or SD card. However, with this I2C interface LCD module, you will be able to realize data display via only 2 wires. If you already has I2C devices in your project, this LCD module actually cost no more resources at all. It is fantastic for Arduino based project.